Yesterday, as anticipated, Apple released their tablet product, the Apple iPad, with much fanfare and criticism. Amidst the technologies in the iPad, with the old (lithium-polymer battery technology, multi-touch) and new (iPad OS) was an important one: the Apple A4 chip. In March 2009, about a year ago, Apple acquired Power Architecture fabless semiconductor chip company P.A. Semi. P.A. Semi aimed to build low-power, efficient, and fairly powerful chips to use in various applications. Then-CEO Dan Dopperpuhl noted that P.A. Semi aimed to develop chips that consumed ten times less power than conventional chips. 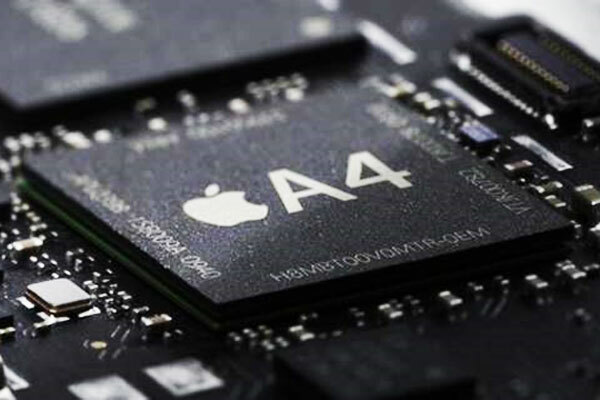 Now with their own in-house team to develop chips for them, Apple released the A4 chip, an ARM-based system-on-a-chip based on ARM Cortex A9 with an ARM Mali 5-series GPU. Rivaling other ARM-based SOAC platforms, like Qualcomm’s Snapdragon or Nvidia Tegra 2, it focuses, quite clearly, on mobile performance with very low power usage. P.A. Semi’s last product was the PWRficient chip, which was a dual-core Power Architecture-based chip that ran at 2GHz and consumed 5 watts (25 watts at peak) of energy. What does the presence of an Apple-designed chip forewarn about the future of Apple products? There are a number of considerations with Apple designing their own chips. Here are some of them. Indeed, through developing so much of their products in-house, like the battery, processor, and other key features, they’re finding ways to control the user experience of their products. And it’s working: their revolutionary lithium-polymer batteries coupled with the Apple A4 processor create not only a pretty dazzling graphics experience, but a long-lasting one. The ten-hour high load battery life and the one month standby (!) are indicative of Apple’s ability to take control of the experience—not to mention the presence of what could be an incredible amount of DRM and security built into the processor, moving from software security to hardware security. Radical innovation has never been a trait that Apple has neglected to execute brilliantly on. But now, Apple is doing so by taking control of the entire computing experience, now even down to the silicon. Few technology companies try to specialize in the finer points in computing, namely the processor. Including Apple, until lately. The iPhone 3GS is powered by the ARM Cortex A8 ARM processor, with PowerVR SGX graphics. We haven’t really seen much that has been developed without ARM-manufactured chips, Intel, Qualcomm, or Nvidia. Has the new chip scared the chip manufacturers? You bet, and it’s also had an effect on the top manufacturers. While Microsoft and Nintendo try to nonchalantly shrug off the iPad as ‘humorous’ and ‘unimpressive’, it is clear that Apple has something they don’t have: a few steps ahead in product technology. All of the mobile phone manufacturers are behind, and while they’re struggling to catch up in technology, Apple will be moving forward. With the Apple A4 processor, Apple set an example: with their in-house semiconductor team from P.A. Semi, they could not only design their own chip, but they could design a damn good one. This would allow for the limitless expansion of Apple products. While competitors are constrained by limitations like processor power and processor energy draw, Apple can get around these limitations. They’ve bought a company that allowed them to design an excellent, efficient processor. There are few things more difficult to design than the very processing center of a technology device. Whenever the next iPhone comes out, we’ll see something like a 700MHz Apple-designed chip in it with a lithium-polymer battery, and when we find out how fast it is and the battery life, Apple competitors will be quite astounded. Repeat by applying knowledge gained from the A4 to a x86 architecture, with the MacBook, iMac, Xserve, and other future Apple products, and it’s clear that Apple could perhaps become the market leader in an incredibly large gamut of technology. It’s more than a processor. It’s an indicator of how important Apple might be in the future to technology and to our lives. The largest predicament surrounding the iPhone (AAPL) seems to be the network: indeed, there seem to be a large number of dropped calls experienced by iPhone users lately, which until recently wasn’t really acknowledged by AT&T. Today, AT&T released an iPhone app that will track problems with the AT&T (NYSE:T) network. Using this tool, users can pick a category of problem (dropped call, failed call, no coverage, data failure, poor voice quality) and a frequency of this problem occurring, which is sent to AT&T along with your GPS coordinates. This will allow AT&T to increase its attention towards problem areas in the network. I never quite understood why companies believed admitting to and fixing a problem was difficult and undoable because of the admitting part. Through such a tool, AT&T gains many advantages. Let’s take a look. Users like that AT&T recognizes the problem. Users like that they took action and released an application to help fix the problem. AT&T gains many data points from millions of iPhone users—each with exact GPS coordinates to see which hives are the worst offenders—from which they can identify pain points and improve their network. In the end, users gain a better experience using AT&T as improvements stemmed from this app are issued. AT&T not only was able to increase its public image and improve their network, but they were able to do so by crowdsourcing millions of AT&T iPhone users’ data, all pretty much free of charge. Sometimes, it’s okay to admit you’re wrong—as long as you fix the problem. It shows responsiveness and shows that the company is trustworthy to the point where they—gasp—admit that they made a mistake. There is a rather new type of venture capital form that is slowly gaining ground. It’s a fusion of angel and venture capital that combines the best of the two creating an excellent middle ground for raising capital. SiteAdvisor and Hunch co-founder, angel investor, and startup icon Chris Dixon announced the launch of seed-stage venture capital firm Founder Collective today, forming an entrepreneur-backed firm making investments worldwide. Headquartered in New York and Cambridge (MA), it is staffed with a number of serial entrepreneurs. In addition to Chris Dixon, it includes angel investors Eric Paley, David Frankel, Bill Trenchard, Mark Gerson, Micah Rosenbloom, and Zach Klein. The notable part of Founder Collective is that all of the partners have been founders or co-founders of a startup, and most of them have done angel investments in the past. The pool of the investments that they have done is available on their Companies page, which represents the depth of the angel investments they have collectively done to date. In Chris Dixon’s blog article, he talks about the new adapted private capital firms. We think of ourselves as part of a new wave venture firms led by Y Combinator, First Round, Maples, Ron Conway/Baseline, and Betaworks, among others, that have adapted to a world where venture capital is abundant but authentic seed capital and, more importantly, mentorship from experienced entrepreneurs, is scarce. The Mark Bao Journal drew some insights from Marc Andreessen’s new firm Andreessen Horowitz, a new kind of venture capital firm based on knowledgeable, serious, and supportive investments. Although it only focuses on seed-stage investments while Andreessen Horowitz does seed and more, Founder Collective is in the same vein of this new kind of metamorphosed private capital firm, a modern capital firm. Adapted capital firms have a number of advantages over older capital firms. backed by entrepreneurs, they leverage the same knowledge as older (and prestigious) Sand Hill Road-esque firms like Sequoia Capital, and offer support from the knowledge they have gathered over the years—as entrepreneurs. the firms are usually backed by at least a portion of partner money, which allows the partners to have the same crucial “investing with my own money” approach that angel investors have, while increasing the volume of money that they can invest with, using outside capital. there is greater incentive for success. Not only do partners take their time more with their money (since a portion of it is theirs), there is a higher chance that they will work closely with the company to make it succeed. This comes from the angel side of the metamorphosical Angel-VC fusion. the partners know what your product does and what’s going on. In many venture capital firms, the senior MPs are quite knowledgeable about the area that they invest in, such as technology. However, the rest of the staff decrease in knowledge about the sector. Zynga CEO Mark Pincus spoke at Startup School 2009 about a junior VC with no knowledge in technology taking over his board at one of his past companies. smaller core staff means more attention by the people that matter. Founder Collective poses itself as a more accessible firm than Andreessen Horowitz. Founder Collective at least has a website, and one can connect to the partners at the firm; on the other hand, Andreessen Horowitz does not have a website and the only way to truly get to Andreessen or Horowitz is to know somebody to connect them. Although Founder Collective is a larger (in staff, not fund balance) firm than Andreessen Horowitz, they will most likely practice the same thing. We try to be respectful. We’ve all sat in countless meetings where VCs show up late, email while you are presenting, and generally act arrogant and dismissive. We try really hard not to be like that. Part of the venture capital culture is intimidation and a bit of disrespect, to show who really holds the power in the transaction. (Not all venture capitalists do this, but it seems like something that generally is associated with venture capital.) And indeed: part of the disdain associated with venture capital is with the venture capitalists that have this attitude. Take a look at TheFunded. The new adapted capital firm is a new movement in funding for businesses. Time will tell how well these turn out—but when you put together established, proven startup entrepreneurs, with rigorously tested new startups, it’s surely going to produce industry-changing effects.